The rainy season is almost upon us, and with the bed weather looming, it is an inviting thought to indulge yourself with good food - something hot, something hearty, and meaty, something smoky, something comforting, like barbecue. And even though the season is not as warm, it will never be too late for a good barbecue. Bulgogi Brothers gives you not one but five reasons to indulge that barbecue craving. Whether you are seafood seeker, a chicken connoisseur, or a red meat raver, Bulgogi Brothers has something from their latest dishes just for you. Start with the Seafood Special for a salmon and apahap combo, or indulge in Spicy Boneless Chicken to sate those poultry cravings sans the fuss. Or you can go big and meaty with hearty servings of Boneless Beef Ribs, LA-Style Short Ribs, and Korean Pork Belly. These new barbecue specials have servings big enough for sharing. 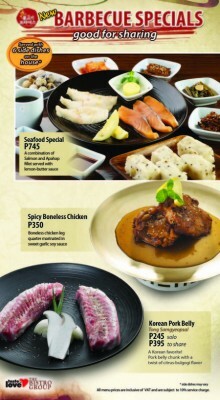 Visit any branch and sink your teeth into some delicious Korean barbecue goodness. Bulgogi Brothers Barbecue Special is now available at their outlets in Alabang Town Center, Greenbelt 5, SM Mall of Asia, Harbor Point Mall, Subic and SM Lanang Premier.